RES-P9242GCL series are 26-port rack mount managed redundant ring Ethernet switch with 24x10/100Base-T(X) and 2xGigabit Combo ports, SFP socket. These switches are designed for power substation application, and it is fully compliant with the requirement of IEC 61850-3 and IEEE 1613. These switches support Ethernet Redundancy protocol, O-Ring (recovery time < 30ms), O-Chain, MRP*note, Fast Recovery and MSTP (RSTP/STP compatible) can protect your mission-critical applications from network interruptions or temporary malfunctions with its fast recovery technology. RES-P9242GCL series can also be managed centralized and convenient by Open-Vision, as well as the Web-based interface, Telnet and console (CLI) configuration. 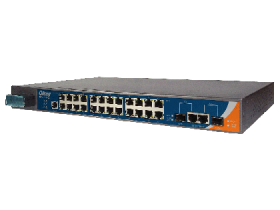 Therefore, the switch is one of the most reliable choice for highly-managed and Fiber Ethernet application. Green Blinking: Indicates that the Ring is broken. 10/100Base-T(X) RJ45 port indicator Green at left for port Link/Act.